We’ve all been there – speaking with the salesperson, pounding our heads against the wall, working to get the best deal on a car while attempting to maintain our sanity. There must be an easier way. There is! 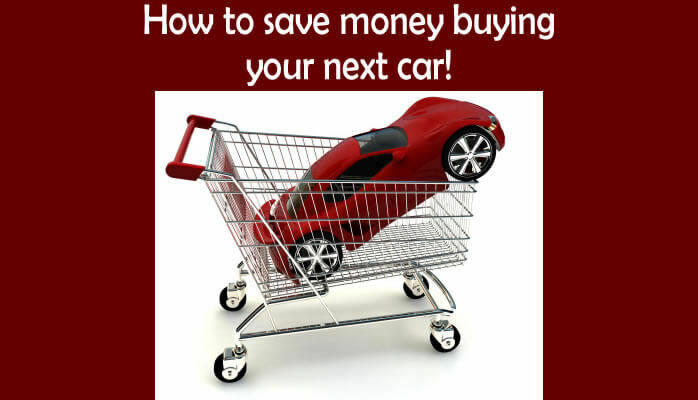 In this post, I’m going to show you proven ways that will save you money on your next new car purchase. I have enlisted the help of my buddy Alex Barone from Winner Ford in Cherry Hill, NJ to get the inside scoop. Let’s dive right in, and start saving money! It may seem obvious to work out the best total deal from the beginning. This causes us to want to negotiate the value of our trade-in first instead of negotiating the value of the new car that we will be purchasing. While it may not seem like it, this is counterintuitive. Start with negotiating the value of the new vehicle. Your trade-in is a separate transaction and should be treated as such. In this way, we are assured to receive the best possible deal on the car we want, rather than trying to sell a car we already own. Only after negotiation of the price for the new vehicle, should we discuss the trade-in value, if applicable. One of the most pernicious exercises that car salespeople will use is speaking about a purchase as a monthly payment rather than its total cost. Please do not get sucked into this trap. Looking at your monthly payment is something to take into consideration after you have negotiated the total cost of the new vehicle. This tactic is often employed to diminish the cost of the vehicle we’re buying and to make it seem lower than it actually is. Only consider the monthly cost after you have negotiated the total cost. “It’s only $400 a month. You can afford that. If you have shopped for a new vehicle in the last several years, it is likely you’ve run across the service TrueCar. The goal of TrueCar is to give buyers an idea of the selling values of similar vehicles in their area. However, TrueCar is not always indicative of the actual vehicle we will be purchasing. Why is this so? Firstly, TrueCar makes its money from dealers not from buyers. However, it does bring a new level of transparency to the market. Secondly, TrueCar does not always represent a one to one comparison. It often shows values of cars with all rebates taken into consideration, and not necessarily the ones that we will qualify for. Tip: when speaking with dealerships, discuss the invoice price, and not the TrueCar price with all rebates in consideration. This way, we arrive at a one to one relationship. Special tip: TrueCar is best used as a gauge of the prices in our area. If we can arrive at prices from multiple dealerships that are within a few hundred dollars of each other for a similarly equipped vehicle, it is likely we are in the ballpark of the price we are going to pay. Recently, I have come across a number of people who have the belief that larger dealerships get a better rate on buying cars from a manufacturer. This is not true. While it is true, that larger dealerships may get better auction prices or have more auction power for used cars, new car prices are set by the manufacturer and not by the dealer. What does this mean? Often times, you might be able to work out a better deal with an independent dealer then a dealer that is part of a large chain or network. While this is not always the case, it is worth exploring a conversation with independent dealers in your area before making a final decision. On the subject, it is just as likely that an independent dealership can offer you as competitive financing rates as a larger dealership. Don’t believe the hype. As mentioned earlier, new cars are often advertised including all rebates available. This might include rebates for graduating college, military service, becoming a senior, etc. This is why it’s important that we understand what rebates we qualify for to negotiate the real price of the vehicle. As you likely know, rebates often come from the manufacturer. Holdback on the other hand, is the amount of incentive that a dealer has between the invoice price and the MSRP to sell a vehicle. Depending on the desirability of a particular model, there may or not be room to negotiate within holdback. If we’re looking at a popular and highly available new vehicle, there might be room to negotiate within holdback; however, if you are looking at a specialized vehicle this will be unlikely. For example, there will be no holdback on the Mustang GT350. Regardless, a price before rebates that is between $500 over invoice and invoice represents the majority of cars sold today. Special tip: dealer trades are often not the place to find a deal because there is a cost with moving a vehicle from one dealership to another. This usually overrides any savings we may receive. Additionally, not all dealers get along. It is more likely we will get the best deal on a new vehicle that is on the dealer’s lot then on another dealer’s lot. Sometimes you may have to go to a different dealer to get the car we want or order what you want. Extra special tip: if you are trading in a car or receiving rebates, each state handles the taxing of this differently. Some states make this much more advantageous to us to trade in the vehicle than others. If you live near the border of more than one state, it may be worth exploring how rebates and trade-ins will affect your total cost in all states near you. This is an often-overlooked area of savings. Do your research online. Find out the different packages offered for the makes that you’re considering and make sure that you ask and receive quotes for the same packages. TrueCar is a great resource to compare relative sales prices in your area. Be sure to compare apples to apples. Don’t forget to check out the websites of the specific dealers in your area. They often have the best deals listed on their own sites. Instead of using various websites like com and Edmunds.com, email each dealership independently for quotes from the Internet sales department. Why do this? To begin with, you will not be inundated with hundreds of offers from dealerships you never heard of. Secondly, you’re dealing directly with a dealership you may buy a car from as opposed to many dealerships at once. Often times the best deals are known to the Internet department of the specific dealership rather than what is displayed in aggregated sites or requests. Don’t forget to check out special buying programs that you may already have access to such as Costco, AAA, possible corporate discounts and other organizations that offer discounts. Many times, these organizations have already negotiated deals at invoice. Do not make an emotional decision. No matter how badly you may want a specific vehicle, be sure to find the best deal available in your area. Try not to be sucked into the trap of dealing with a monthly payment amount versus the actual amount of the car you will be buying. It’s easy to spend more money than you expected or planned for by doing this. Lastly, be sure to check out how rebates and taxes affect your overall purchase and negotiate your trade-in last. I hope you have found this post helpful and I believe it will save you money in your current or future purchase of a new vehicle. If you ever feel that you are being pressured or you are not comfortable don’t be afraid to leave the dealership. After all, you will be paying for the vehicle either now or for an extended period. With a little work, not only can you save money but you can get the vehicle that you want.